You’ve Got Mail. Warner Bros. 1998. Before watching the movie: The late 90s, a time when the internet was just beginning to be a thing normal people used, when it was beginning to be treated like the post office or telephone and nobody had a business interest in controlling access to it. “Shopgirl” and “NY152” met in an AOL chatroom and immediately hit it off, emailing each other behind their respective partners’ backs, carefully omitting all personal details. Behind the screen, Shopgirl is Kathleen Kelly, second-generation owner of children’s bookstore The Shop Around The Corner, and NY152 is the face of the corporate competition coming into town, Joe Fox of the Fox and Sons mega bookstore chain. Meeting face to face without realizing they already have an online relationship, business clouds their interaction and they become enemies. Warring professionally and bonding privately, the truth won’t be an easy transition. I was surprised to learn that this film was an update to a story written in 1937 and produced as a film twice before 1950. Corresponding anonymously is much more common in the internet age than it was before, so it feels like a concept that the world finally caught up with. This movie is also a great example of how “online” relationships are “real”, even if it doesn’t say so explicitly (and the promotional material uses “reality” terms as antonyms to “online”). If anything, the online side of their relationship is more real than their face-to-face interaction, where they become the hostile character they think the other expects them to be. Joe especially seems like he’s playing a character when in business mode, even before he learns the truth and keeps it from Kathleen. For the first half of the story, he seems to always be in a suit, his battle armor. Sometimes when online he might appear in casual clothes, but once he’s fixing the relationship, we never see the suit again. He’s oddly shifted from part-time antagonist to the hero, which I’m not entirely comfortable with. The first half of the story is with Kathleen, but then once Joe is let in on the dramatic irony, it’s the story of him somewhat manipulating her to adjust their relationship to the point where he can reveal it to her. He’s only correcting her impression of him, but it’s still a bit disturbing for the heroine to become a project for her former antagonist to “tweak”. Obviously, AOL has fairly prime product placement as the conduit through which the characters meet as well as the source of the title. It may well be corporate synergy, or close to it, since this movie was produced by Time Warner, which infamously lost a lot of money merging with AOL the very next year. However, what really caught my attention was all the real books. The Shop Around The Corner, being a children’s bookstore in the late 90s, is full of my childhood, which lends a surprising amount of verisimilitude, and got me thinking about an independent children’s bookstore I used to go to. This movie is worth it for just dramatic irony running through the entire story, let alone the Hanks/Ryan chemistry, the bibliophilic flavor, and the (now dated) tech-savvy concept bringing an unusual story dynamic home. 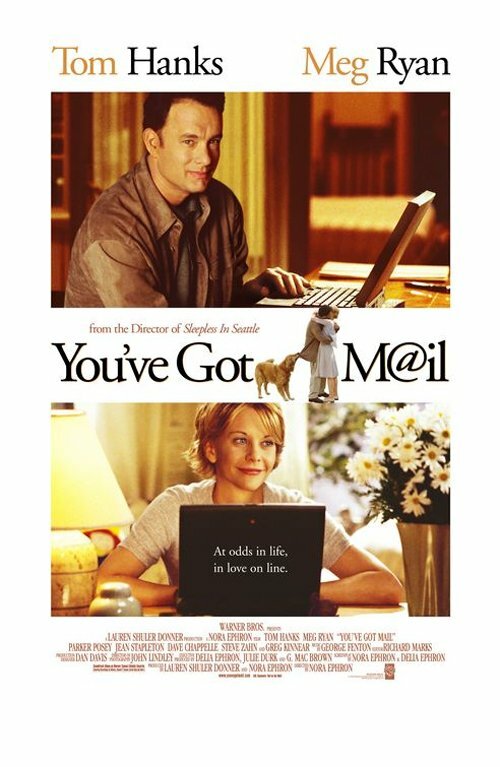 “You’ve Got Mail” holds a special place in my heart because it was the movie that my wife and I saw together on our first date. I enjoy any film if it stars Meg Ryan because although she was often praised as a romantic comedy queen, she was routinely under-appreciated as an actress. I think Meg demonstrated in “You’ve Got Mail” more than any other film in her career how much craft she put into her performances. Under Norah Ephron’s direction, she delivered probably the most mature, humanly-inflected work of her career, it’s just a shame that the backlash to her acrimonious divorce, a couple of years after this film, effectively ended her career as an A-list actress. Anyway enough of my ramblings, I enjoyed your review and I’d like to wish you the best of luck with Yesterday’s Movies in the future. I’m currently doing a blog on remembering the nineties and all the things awesome that came with it. I really enjoyed reading this blog. It some how put a nice perspective on the online internet dating and back when it was not dangerous or people got ‘catfish’ed. I still remember the day that the first computer and internet came into my household. I used to mess around on chat sites and messengers all the time and never once considered it dangerous. I can only imagine what it would be like now, not to mention the millions of viruses that are given to your computer every time you get on one. Yikes! I’m not sure I’ve ever been in a fully public chatroom, but I still use IRC channels for chatting with friends in some circles. I hope our culture is circling back around to recognizing that most people online are as honest about themselves as they would be face to face. The nefarious ones get more exposure, but as we spend more of our time online, we hopefully run into a lot more people who have no reason to lie and are just reaching out to others with similar interests that we never would have met without the internet. I’ve long felt a bit uneasy about people who seem to think that others are not “real” when out of eyeshot. Relationships are between people; a computer, or a telephone, or a piece of letter paper, or the space in a room or under a sky, are just the medium through which they happen to be relating. And in any medium, others only know us by what we choose to reveal and what we fail to conceal. It’s for that reason that I try to use the silly-sounding “meatspace” or the unwieldy “face-to-face” to describe interactions not mediated by technology, instead of “in real life”. There aren’t options I really like, but at least they don’t dismiss those interactions as fantasy.